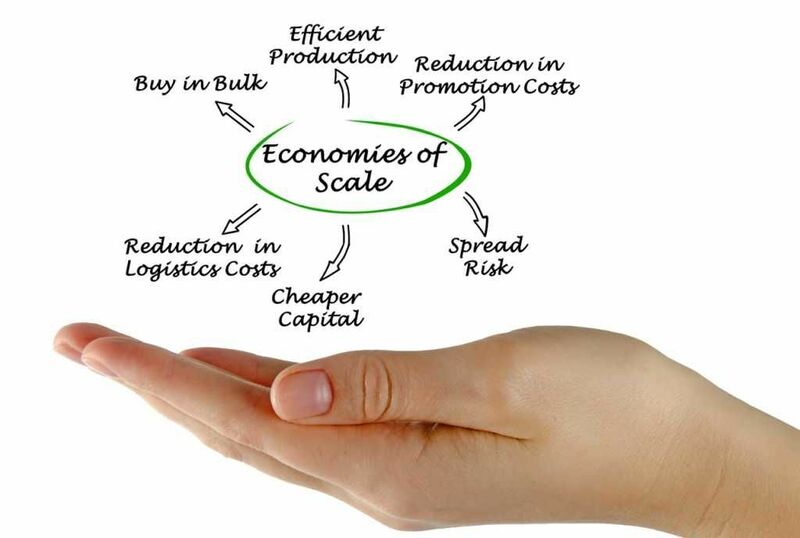 Economies of Scale refer to the cost advantage experienced by a firm when it increases its level of output. 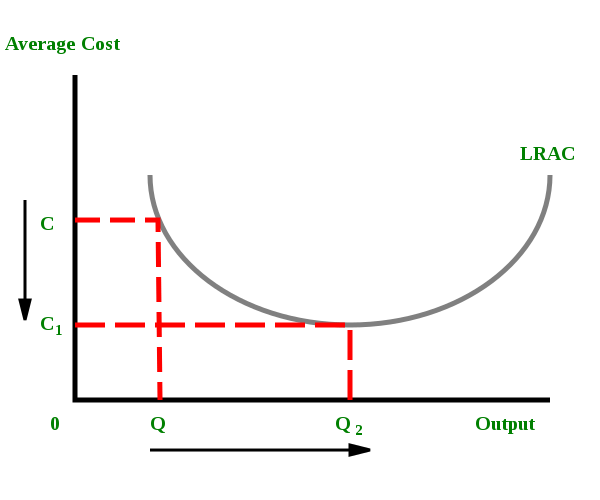 The advantage arises due to the inverse relationship between per-unit fixed cost and the quantity produced. The greater the quantity of output produced, the lower the per-unit fixed costFixed and Variable CostsFixed and variable costs are important in management accounting and financial analysis. Fixed costs do not change with increases/decreases in units of production volume, while variable costs are solely dependent on the volume of units of production. This guide teaches an analyst the fixed vs variable cost methods. Economies of scale also result in a fall in average variable costsFixed and Variable CostsFixed and variable costs are important in management accounting and financial analysis. Fixed costs do not change with increases/decreases in units of production volume, while variable costs are solely dependent on the volume of units of production. This guide teaches an analyst the fixed vs variable cost methods (average non-fixed costs) with an increase in output. This is brought about by operational efficiencies and synergiesTypes of SynergiesM&A synergies can occur from cost savings or revenue upside. There are various types of synergies in mergers and acquisition. This guide provides examples. A synergy is any effect that increases the value of a merged firm above the combined value of the two separate firms. Synergies may arise in M&A transactions as a result of an increase in the scale of production. Economies of scale can be implemented by a firm at any stage of the production processCost of Goods Manufactured (COGM)Cost of Goods Manufactured (COGM) is a schedule showing the total production costs during a specific period of time. See COGM formula & examples in this guide. COGM is the total costs incurred to manufacture products and transfer them into finished goods inventory for actual retail sale. In this case, production here refers to the economic concept of production and involves all activities related to the commodity not involving the final buyer. Thus, a business can decide to implement economies of scale in its marketing division by hiring a large number of marketing professionals. A business can also adopt the same in its input sourcing division by moving from human labor to machine labor. It reduces the per unit fixed cost. As a result of increased production, the fixed cost gets spread over more output than before. It reduces the per unit variable costs. Economies of scale bring down the per unit variable costs. This occurs as the expanded scale of production increases the efficiency of the production process. Image: CFI’s Financial Analysis Courses. The graph above plots the long run average costs faced by a firm against its level of output. When the firm expands its output from Q to Q2, its average cost falls from C to C1. Thus, the firm can be said to experience economies of scale up to output level Q2. (In economics, a key result that emerges from the analysis of the production process is that a profit-maximizing firm always produces that level of output which results in the least average cost per unit of output). They refer to economies that are unique to a firm. For instance, a firm may hold a patent over a mass production machine, which allows it to lower its average cost of production more than other firms in the industry. They refer to economies of scale faced by an entire industry. For instance, suppose the government wants to increase steel production. In order to do so, the government announces that all steel producers who employ more than 10,000 workers will be given a 20% tax break. Thus, firms employing less than 10,000 workers can potentially lower their average cost of production by employing more workers. This is an example of an external economy of scale – one that affects an entire industry or sector of the economy. Firms might be able to lower average costs by buying the inputs required for the production process in bulk or from special wholesalers. Firms might be able to lower average costs by improving the management structure within the firm. The firm might hire better skilled or more experienced managers. A technological advancement might drastically change the production process. For instance, fracking completely changed the oil industry a few years ago. However, only large oil firms that could afford to invest in expensive fracking equipment could take advantage of the new technology. Consider the graph shown above. Any increase in output beyond Q2 leads to a rise in average costs. It is an example of diseconomies of scaleDiseconomies of ScaleDiseconomies of Scale occur when an entity is on the verge of expanding, which infers that the output increases with increasing marginal costs that reflect on reduced profitability. Economies of scale no longer function at this point, and instead of maintaining or reducing costs for the continuity of the business, the – a rise in average costs due to an increase in the scale of production. As firms get larger, they grow in complexity. Such firms need to balance the economies of scale against the diseconomies of scale. For instance, a firm might be able to implement certain economies of scale in its marketing division if it increased output. However, increasing output might result in diseconomies of scale in the firm’s management division. Watch this short video to quickly understand the main concepts covered in this guide, including the definition of economies of scale, effects of EOS on production costs, and types of EOS.